Penguin Diner 5 belongs to the genre of point and click games. It is a fantasy cooking game where you have to help in running a diner. The tasks include welcoming a customer and seating them on suitable tables, taking their orders, serving the food, cleaning the table and collecting the money. You can customize the settings of the diner and the penguin who runs the diner by buying stuff from the catalog once you have money in Penny the Penguin’s bank. You can move on to the next day if you achieve the target money collection set for the first day. The game can be played with the help of a mouse. This is a single player game. A left click often signifies an action. When you require the penguin to move to some table or to carry food, the control to press is the left button of your mouse. 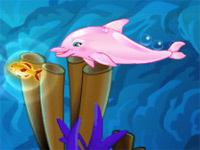 All actions in this game are performed through the left click of the mouse. In the main menu, you have to click on Play game. When you click on it, you will be taken through a few instruction pages where the story and objective are explained. You can move through these pages using the Next and Previous links on the screen. Once the instructions are over, you have to click on Start to start the game. As the customers pile in, you have to click on each customer and on an empty table. When the customer is ready for placing an order, you have to click on the table to take the order. When the food is ready, it will be placed on the counter. You have to click on the food and then on the table to serve the food to the customer. When the customer is done, he will leave coins on the table. You have to click on the table to collect the coins left behind and to clean the table. This process of seating, serving and cleaning will continue until the diner closes for the day when you should have achieved the set target. When you play the game for first time, hints will be displayed to let you know what actions are required from you. If you want the hints to continue after the first few moments, you can pause the game. When you pause the game, the options you get will include ‘restart hints’. This option will let you get hints on the gaming screen again. Remember that speed is the important part of this game. The quicker you serve the customers, bigger will be the money left behind. You can buy skates from the upgrades section to make the penguin move faster across the floor. Also you can use the fact that the penguin can carry two trays of food each time to increase the service speed. When you click on Pause and then End for day, your game will be saved and you can resume another day or time from the same point. If your service is quite slow, it is possible for customers to leave the diner. If a customer is already seated and waiting for food to be delivered, the penguin customer will start to get angry. You can see this by the red colored face of the penguin. In such case, if the food gets further delayed, the penguin will leave the diner without finishing the food. You have to empty the contents of the plate in a trash can in such a case.